Today I am sharing the next book after Peanut Butter and Cupcake by Terry Border. 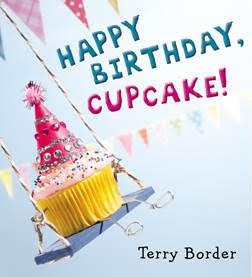 The new book released earlier this month is Happy Birthday, Cupcake! It has many of the same characters as Peanut Butter and Cupcake as well as the same type of pictures. Hazel and I were introduced to Peanut Butter and Cupcake at a story time at Barnes and Noble. 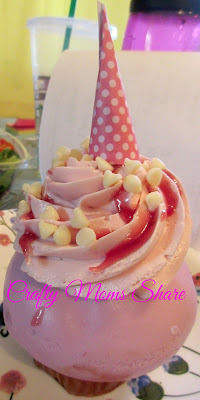 In Happy Birthday, Cupcake! Cupcake tries to plan her birthday party. She wants to invite all of her friends. She asks her friend, Muffin, to help. Cupcake has several ideas for her birthday party, but Muffin points out a problem with each of them. They continue to walk the eclair dog. 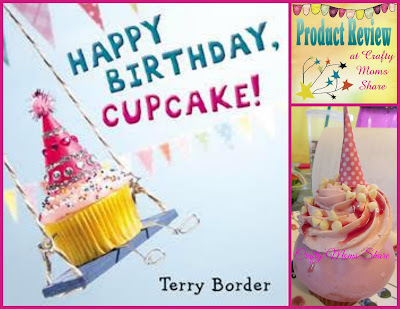 Cupcake's ideas include a beach party building sprinkle castles, a boat party, a spa party, play musical chairs with a band, and play limbo. After exhausting all of her ideas Cupcake is tired and frustrated. Muffin suggests relaxing in its garden. When Cupcake opens the gate all of her friends yell, "Surprise!" and the party begins. To go with this book I have many ideas, but unfortunately have not been home enough this month to actually do them. We bought a white chocolate raspberry cupcake from Whole Foods and made it a paper hat. After taking some pictures we shared it. However there are many ideas for a play date or party around this book. After reading the book there could be many fun activities. Taking Cupcake's ideas the activities would be building sand castles (or sprinkle castles with sprinkles and frosting), frosting and decorating a cupcake (the spa), and play musical chairs and limbo. Then end with dancing and eating cupcakes of course! Each guest should have a party hat, so decorating and/or making party hats could be another activity. The menu could be the characters from the book as well: muffins, soup, chocolate, peanut butter and jelly on bread, hamburgers, baked beans, ice cream, donuts, cookies, baked potatoes, waffles, hard boiled eggs, corn on the cob, peanuts, cupcakes and eclairs. I know this would be a fun play date that Hazel would enjoy. 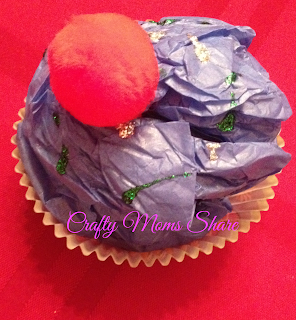 There are also many cupcake crafts floating around on-line. We made one recently using the book Sneaky Art. We also had a cupcake themed first birthday party for Hazel and I made these paper cupcakes and filled them with pink and purple M&M's as favors. I bought templates to make them. I can honestly recommend this fun book as well as the first one. They both are fun and amusing and have so many ways to expand into play and lessons! I hoe you will check them out!